Few ingredients are needed to prepare this useful lemon balm remedy for topical application. Learn how to make lemon balm cream and see more about the benefits of having it in your herbal cabinet. Unlike a salve or ointment, which mixes two associated elements - like a carrier oil and a wax or two fats with different density - a cream includes water, which can be combined with an insoluble element (e.g., olive oil) or a water-soluble element (e.g., glycerin), and uses a bonding agent called an emulsifier. That's why creams are sometimes referred to as emulsions. Melt the emulsifying wax in a glass bowl nested in a saucepan half filled with water that is already over minimum heat. The bowl should fit tightly in the saucepan, but it shouldn't touch the water. This is called a double boiler. Once the wax is melted, stir in the glycerin, water, and the lemon balm leaves (fresh or dried). Simmer for three hours. Remove from the heat and strain the mixture through a cloth. Stir slowly but continuously until it cools and sets. With a small knife or a spatula, place the set cream into sterilized, dark glass jars. Tighten the lids and label. Store in the fridge as soon as possible. Small amounts of lemon balm tincture or lemon balm essential oil can be added to the cream before or after putting it in sterilized, dark glass jars in order to prevent mold growth and prolong shelf life. Lemon balm cream can last up to three months refrigerated. The cream of lemon balm will be quickly absorbed by the skin and have the advantage of being cooling and soothing while allowing the skin to breathe and sweat naturally. Because of its antiviral and analgesic properties, lemon balm cream can be used for the topical treatment of herpes simplex virus sores, both oral and genital, as well as for daily skin care, due to its astringent and soothing actions. For medicinal purposes, the standard application consists of rubbing the cream on the affected area two to three times a day. 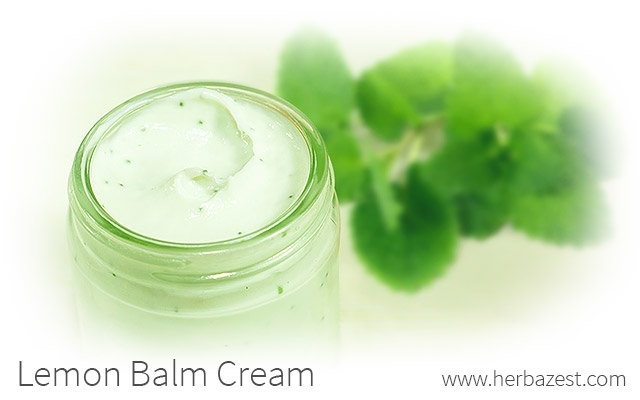 Lemon balm cream is a very useful preparation, easy to make and store, and its medicinal and cosmetic applications make it a must-have at home.